If there is one thing we know about King Arthur it is that he was 100% British. Right? He was, as we know, king of Britain - and his Knights of the Round Table embodied the noblest of British virtues: chivalry, bravery, dependability, dedication and honour. The Arthurian legends have come to form an inseparable part of the national identity of Britain. It is said that somewhere, on an island or beneath a mountain, King Arthur lies asleep waiting for the call to come once again to save his country at the time of its greatest need. At the risk of spoiling the illusion, there is a strong case that the Arthurian legends have more to do with France than Britain. If you want look for sites connected with Arthur, you’ll find far more in France than on the other side of the English Channel. You need to start with a little faith because the story of Arthur as we know it today in books, films and television programmes is a compilation of oral traditions and later inventions. It is possible, however, that behind it all there is a basis of historical fact. The first accounts of King Arthur emerged in England or Wales during the Dark Ages. It was a Welsh writer, Geoffrey of Monmouth, who first gave them cogent form. He insisted that Arthur was a historical character and king of the Britons. He, too, embellished his story with the magician counsellor, Merlin. In 1191, not long after Geoffrey’s version of Arthur appeared, the monks of Glastonbury abbey claimed to have found the graves of Arthur and Guinevere, thus locating the site of the mythical island of Avalon (where Arthur was taken to die - or be preserved in suspended animation, as you prefer). Since then, Arthur has been indisputably British. Curiously, however, something else happened towards the end of the 12th century. The initiative in the developing saga of Arthur switched to France and one person in particular developed the character and added ingredients of his own. We do not know much about the court poet Chretien de Troyes, who was probably a retainer at the court of Champagne, except his presumed place of origin and the fact that he wrote five poems. The most interesting of these is tantalisingly unfinished. It tells the story of the Holy Grail, an object that is first glimpsed by one of Arthur’s knights, Percival, when he is staying in the castle of the Fisher King. Chretien also introduces us to Lancelot du Lac and mentions Camelot in passing. Two other French poets added to the accumulating tales of Arthur and his knights. The Norman poet Wace (c1110-c1174) was the first writer to mention the Round Table and Arthur’s sword, Excalibur. Robert de Boron (late 12th/early 13th centuries) gave an all important twist by associating the Arthurian legends with Christianity. He offered an explanation of what the Grail was and how it came to be in Europe. To French writers in the Middle Ages the Arthurian legends were known as the Materie de Bretagne, the Matter of Britain, but it is almost certain that Britain provided only the exotic overseas location and the character of King Arthur himself. Everything else they added came from local Celtic legends or inspiration they took from their own surroundings. Claudine Glot, author, Arthurian expert and co-founder of France’s Arthurian Centre in Brittany stresses that the stories were the product of cross-cultural fertilisation. “The material may have come from England but the books were written in France and there was much toing and froing between the two countries. In recent years, doubt has even been cast on the credentials of the man who made Arthur a Briton. Despite his name, Geoffrey of Monmouth may not have been Welsh at all but Breton, possibly from Dol-de-Bretagne, in modern-day Ille-et-Vilaine. It is thought that he was he was a descendant of a member of William the Conqueror’s retinue and he may have fused inherited Breton or Norman traditions with local Welsh legends. A second-generation immigrant, in other words, who wanted to be appear more nationalistic than the locals. Brittany is the region of France most associated with the Arthurian legends. Before France was unified, Britain (la Grande Bretagne) and Brittany (la Petite Bretagne) had close ties. Legends may well have been exchanged. Several episodes of the saga take place in the magical Bois de Broceliande, which is now generally accepted to be the Fôret de Paimpont, west of Rennes. Further east, Burgundy is the up-and-coming Arthurian location in France. The historic town of Avallon, near Vezelay, could be a more plausible candidate for the Avalon than Glastonbury. The closer you look at Arthur, the more he appears to be of dual nationality, with roots as strong in France as in Britain. Not that it much matters. The point is not to find a ‘real’ Arthur but to enjoy looking for him. recently published by Findhorn Press. Several episodes of the Arthurian saga take place in the magical woods of the Bois de Broceliande. This mythical forest is now generally accepted to be the Fôret de Paimpont, southwest of Rennes, in Brittany. The best place to begin a tour of Arthurian locations here is the Centre Arthurien housed in the Château de Comper near Concoret, north of Paimpont. In front of the chateau is the lac de Viviane, said to be the domaine of the Lady of the Lake. A little to the northeast of the chateau is a Neolithic monument known as the Tomb of Merlin. It was believed that the megaliths were built by the Druids and legends were attached to them. Close by is the so-called enchanted Fountain of Youth. One of the most enchanting places to visit in Paimpont is the Église Sainte-Onenne, in Tréhorenteuc, on the western edge of the forest. It is often known as the Grail Chapel because of its beautiful symbolic decoration created after the Second World War by two German prisoners of war. 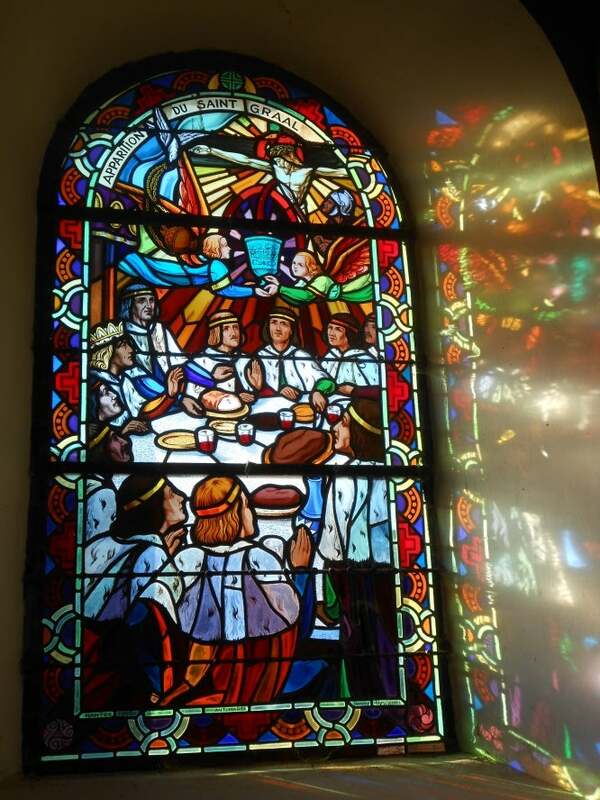 Stained glass windows show the appearance of the Holy Grail and the Round Table. The local tourist office markets Trehorenteuc by reference to a nearby beauty spot, the Val sans Retour, 'the Valley of No Return', where Arthur’s sorceress half-sister Morgan la Fey supposedly imprisoned her lovers. The Paimpont-Broceliande forest is undoubtedly much smaller today than it was 1,000 years ago. In the 1960s, local researcher René Bansart became convinced that the forest extended into southwestern Normandy (the base of the Cotentin peninsular) and the north of the Mayenne department, around the ruined castle of Domfront and the Andaines forest. Here, claimed Bansart, was the homeland of Arthur’s most renowned knight, Lancelot-du-Lac. According to Bansart’s theory, the poet Chretien de Troyes found inspiration for Lancelot in the locally venerated saint, St Frambaldus (died 570), whose shrine is near Lassay-les-Chateaux. Bansart’s work is continued by a local association, CENA that publishes information about lesser-known Arthurian sites in this corner of France. There is no place called Avalon - the mythical isle where Arthur was taken at the end of his life – in Britain. But there is an Avallon in Burgundy. It is northwest of Dijon, near Vézelay. It was Mrs Gaitskell, of Cranford fame, who first speculated that Avallon could be the Avalon while doing the Grand Tour in the 1860s. Mainstream Arthurian scholars long regarded the name as just a coincidence but author Marilyn Floyde believes the small Yonne town has a better claim to be the Avalon of legend than Glastonbury. She began by working closely with Arthurian expert Geoffrey Ashe, who explored the Burgundy connection in his book The Discovery of King Arthur (1985). Arthur, he wrote, was based on the real historical figure of Arthur ‘Riothamus’. This theory of the origin of ‘King Arthur’ has never been effectively challenged. Arthur ‘Riothamus’ (meaning ‘Highest King’) ruled Britain between 454-470AD and towards the end of his life led an army to France. He was defeated by the Visigoths at Bourges and forced to flee ‘to the east, to his allies the Burgundians’. It is probable that he went towards the Roman garrison of Avallon and sought medical attention for his soldiers at the sanctuary of Les Fontaines Salees, on the banks of the river Cure. Marilyn Floyde tells the story, and presents fresh evidence for Riothamus being King Arthur, in the second edition of her book King Arthur’s French Odyssey: Avallon in Burgundy. “In the back of my mind I had always been bothered about the ‘Island’ aspect of the legendary ‘Avallon’,” she said. “People would say to me, ‘That’s all very well, but wasn’t Avallon supposed to be an island? How does that fit with Burgundy? Burgundy’s just about as far from the sea as it’s possible to get in France’. “It is far from uncommon to find French ‘Isles’ inland; islands created by rivers or other waterways, not necessarily the sea. There are two other contenders for Avalon in France (based on speculation rather than evidence), both in Brittany: the Ile-de-Sein off the tip of Finistere where, it is said, nine Celtic priestesses presided over a pagan sanctuary; and the tiny, privately owned Ile d’Aval near Pleumeur-Bodoual on which stands a megalith and the remains of a monastery. by Marilyn Floyde is published by Books Sans Frontieres (BSF) publishing. Was there ever really an object called the Holy Grail? And, if so, what exactly was it and what became of it? Did Chretien de Troyes have a real castle in mind when he imagined Percival’s vision? An entire sub-industry of mystery hunters has grown up to address these questions. The Holy Grail is generally agreed to have been a cup used at the Last Supper. According to legend, at the Crucifixion it was used by Joseph of Arimathea to collect Christ’s blood. Joseph then took the Grail to Avalon. Several places in Europe claim to have the original Holy Grail. The best known of them is Valencia, in Spain. Various locations have been suggested for the Grail castle described by Chretien de Troyes, including Montségur, the last refuge of the Cathars, in the Pyrenees and the surroundings of the former Gorze abbey in Lorraine. While not specifically connected to the Grail, the Abbaye de la Trinité in Fécamp, on the coast of Normandy, claims to have some of Christ’s blood among its relics; while the ‘mystery capital of France’, Rennes-le-Chateau, in the Aude, also crops up in several theories about the Holy Grail. You can believe what you want to believe.